Nick Offerman's Good Clean Fun with my travel toolboxes at the Lie-Nielsen Hand Tool Event at Shackleton Thomas Furniture, in Bridgewater, VT this weekend. 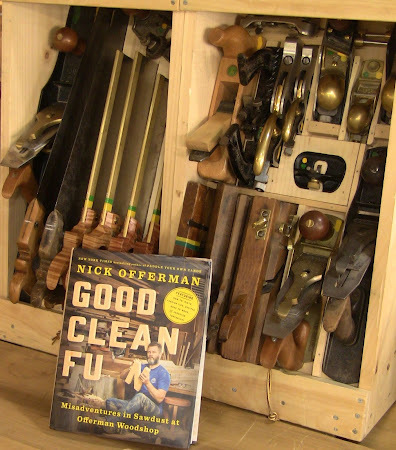 This past week I got the opportunity to review Nick Offerman's new book Good Clean Fun: Misadventures in Sawdust at Offerman Woodshop, published by Dutton. It goes on sale October 18. Most people know Offerman from his role as small-town functionary Ron Swanson on the TV show Parks And Recreation, whose desk trinkets include a Claymore antipersonnel mine facing anyone approaching his desk. But woodworkers know him from his Fine Woodworking articles as a fellow woodworker who has a nice side gig as an actor and humorist. Ok, you probably mainly know him from the show as I did, and were tickled to find out he's also an honest to goodness woodworker, running the real business Offerman Woodshop. I was just as tickled to get the opportunity to review his book. This is his third book, the first one that is wholly about woodworking. His two previous books were Paddle Your Own Canoe: One Man's Fundamentals for Delicious Living and Gumption: Relighting the Torch of Freedom with America's Gutsiest Troublemakers. He writes with a reverently irreverent style. If Mark Twain had been a woodworker, this is the book he would have written. Informative, yet informed by a dry and acerbic wit. His reverance is for the craft and the skill. Yet he doesn't take himself too seriously. Much of the character of Ron Swanson is clearly imbued with Offerman's true self. The book is a combination of brief autobiography, woodworking knowledge (including a great chapter on wood, with an excellent analogy for understanding grain and wood movement), profiles of woodworkers he admires and those who work in his workshop, and projects. There's a lot of solid, practical information. Plus, as it says on the cover, assorted tomfoolery. It's all good clean fun, with some recipes thrown in to enjoy while you're having it. I always love finding the connections between people, and I'll point out a few here. Some tenuous, but they bind us together nevertheless with a sense of community. That's another strong theme in the book, community. Offerman got his early woodworking knowledge from his Dad. 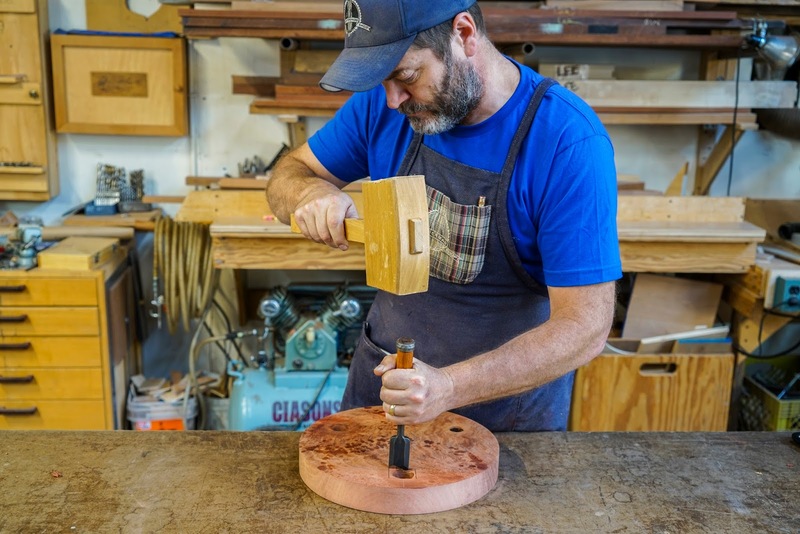 That ability to swing a hammer got his professional woodworking career started as a scenic carpenter in the theater, and he admits to an affinity for scenic carpenters in his workshop today. One thing that's clear, he's on the same page with most of the woodworkers I know who value working with your hands. And lament the loss of that in our present society and educational system. And wish to restore that capability. That's the first connection I'll note. Right there with you, brother. Nick squaring up the leg mortises in the Berry Stool project. Photo by Josh Salsbury, courtesy of Dutton. Inspiring people to learn how to do things with their hands appears to be one of his main goals in writing the book. That's just as clear, based on his choice of profiles and projects. 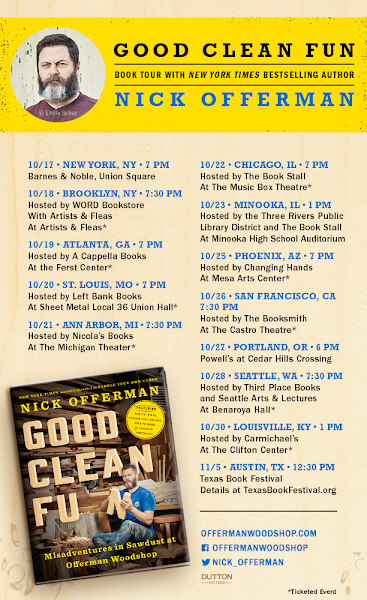 I'm also very happy to see Offerman promote and encourage the work of others in his profiles. The book isn't just about him. Like I said, it's about community. Among the profiles is Mira Nakashima, daughter of the late George Nakashima, who specialized in Japanese-inspired works featuring live-edge tree slabs. In 1976, I lived two towns over from Nakashima's workshop in New Hope, PA, and would often ride past on my bike. Those were the days when schools still had shop class, and as a high school student I loved woodshop. I would see the sign and wonder what they did there, but never stopped to find out. Of course, that's just random coincidence. Another profile is Chris Becksvoort, the "modern master of the Shaker style", as Ron Swanson giggles with glee in one episode of Parks And Recreation. I've had the pleasure of watching Becksvoort demonstrate techniques at several Lie-Nielsen Open Houses in Warren, ME. The strongest connection among the profiles is Peter Galbert. I've demonstrated at several Lie-Nielsen Hand Tool Events where Peter and his colleague Claire Minihan have also been presenters. I think of Peter as an inventor as much as a woodworker, for his innovative tool designs. It was Peter who taught me how to finesse a wooden spokeshave to vary the shavings from light to heavy, and watching his YouTube videos led to an order of magnitude improvement in my lathe turning skills. These are people worth learning from. The profiles are all interesting reading as Offerman outlines what he admires in them. There are some good tidbits of professional woodworking business knowledge thrown in, and some inspirational surprises. 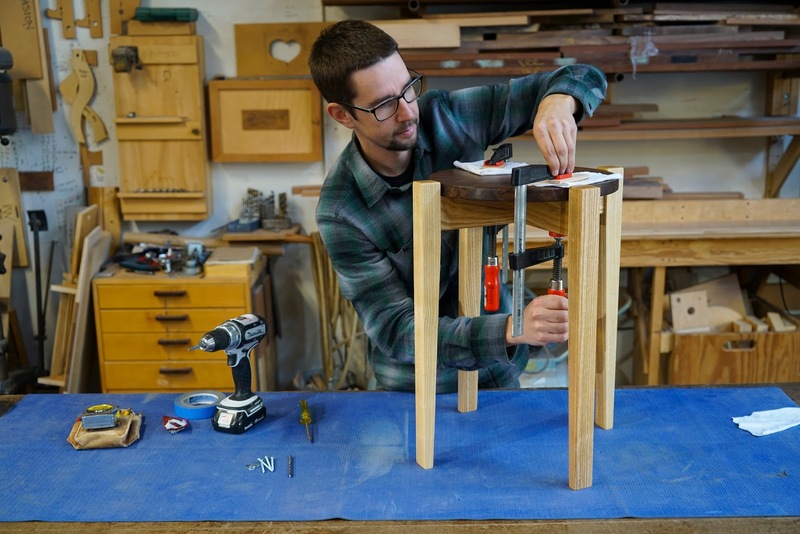 Josh Salsbury clamping the top of the Jupiter Side Table project. Photo by Christine Fuqua, courtesy of Dutton. The projects span a range of skill levels. Nakashima-style slabs feature in several of them, that's clearly a major influence in his shop. Even the simplest ones impart useful knowledge to entice the beginner, and there are a number of nice projects to engage the interest of more experienced woodworkers. The styles are contemporary, reflecting what I would consider a California esthetic, considering the strong influences of James Krenov and the College of the Redwoods among the people profiled, similar to the work of David Marks. The methods of work are a combination of machine and hand tool woodworking. There's also a bit of metalworking that would be fun to explore. Even if the designs aren't to your tastes, these make good projects to acquire skills you can apply to other designs. In addition to furniture-making techniques, there's information on finishing and ebonizing, and strategies for avoiding or correcting mistakes. If you're interested in working with big natural-edge slabs, there are several tips for working on them. My favorite project is the slingshot dining chair by Michele Diener. Chairs are a particular challenge, because they take a beating. They have to survive being kicked, pushed, dragged, and bumped daily for years, yet not collapse under someone sitting on them. Meanwhile they have to be comfortable and lightweight. 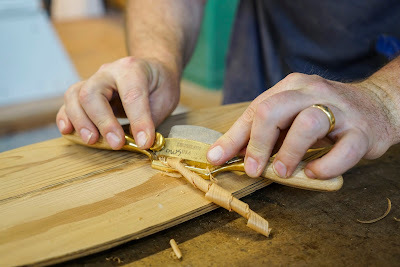 Nick shaping the blade of the Beaver Tail Paddle project with a Lie-Nielsen Brian Boggs spokeshave, one of my favorite tools. Photo by Josh Salsbury, courtesy of Dutton. If the excellent project drawings cause a ping of recognition, it's because they're by John Hartman, an illustrator for Fine Woodworking magazine, among others. Before the last project, the book finishes up with an assortment of recipes contributed by the shop denizens for their lunches and cookouts. That final project is another interesting one, a knockdown bed. I always find knockdown furniture fascinating because it goes together and comes apart like a puzzle, yet has to be sturdy in use. That poses significant challenges in design and execution. 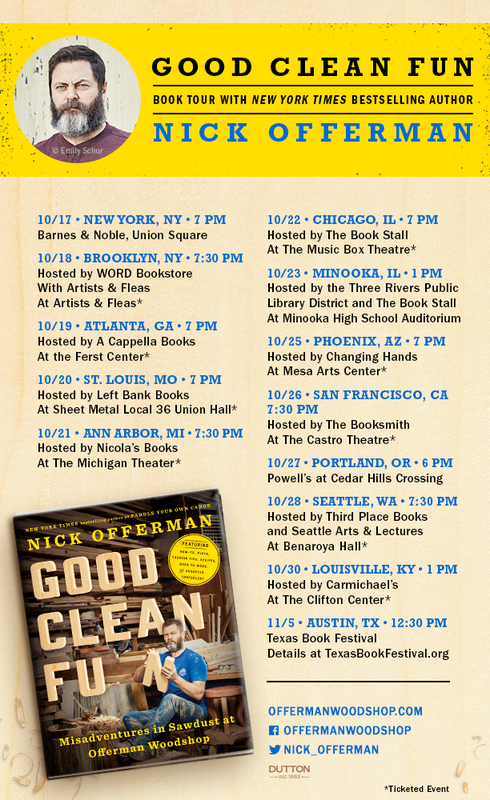 Nick will be going on a book tour from October 17 through November 5 if you'd like an opportunity to see him. Tour information, courtesy of Dutton. Thanx for the review Steve. I'll buy it when it comes out.